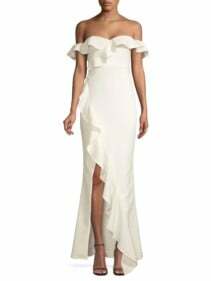 For brides planning ahead for a summer wedding, these strapless wedding dresses are simply perfect. We are particularly smitten with the 3D embroidered strapless ivory gown by Marchesa Notte. With floral applique embellishments and a classic A-line silhouette, this ethereal tulle gown is straight from a fairy-tale. 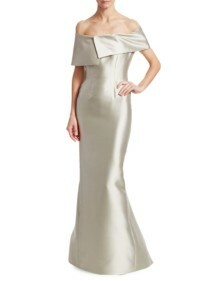 The midi length skirt adds a modern edge whilst the strapless bodice defines the figure. 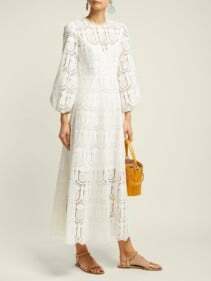 Styling this dress with heeled sandals and tousled curls is a perfect look for a spring or summer union. 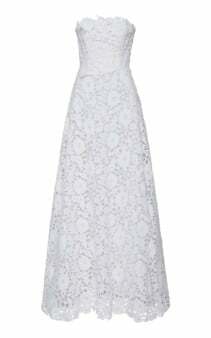 If you would prefer something more classically traditional, the Gertrude lace white gown by Carolina Herrera Bridal is a wonderful choice. This breathtaking gown is made from a delicate cotton and lace blend making it as comfortable as it is beautiful. With all-over lace detailing, a cut out back and oversized bow detailing, this dress is eternally romantic. The gorgeous A-line skirt also extends into a train for a simply unforgettable walk down the aisle. In this modern age, no bride should feel that wedding dresses need to be, what most consider, traditional. These days, wedding ceremony’s come in all different styles and sizes and so too should our dresses. 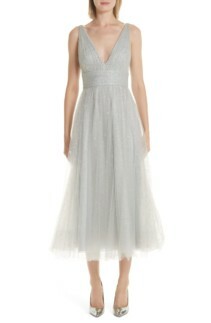 The aptly named Cool Girl maxi silver dress by Freepeople is the ultimate gown for the modern bride. 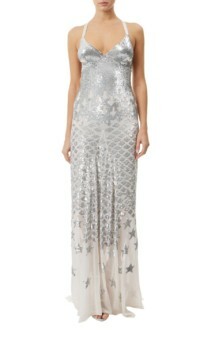 All over sequin detailing ensures a dazzling entrance whilst the plunge cowl neckline adds a further playful touch. There is also a V-back, dropped armholes and a statement split in the skirt. Choose to wear this dress alone for maximum impact or make it your own with a mesh top underneath. For a more simple yet no less beautiful look, we suggest the ‘Ballet Couture’ light pink tulle dress by Needle and Thread. This dress made from dotted jacquard tulle is simply stunning in its simplicity. Style it with heeled sandals and a delicate bouquet for a look of timeless bridal elegance.